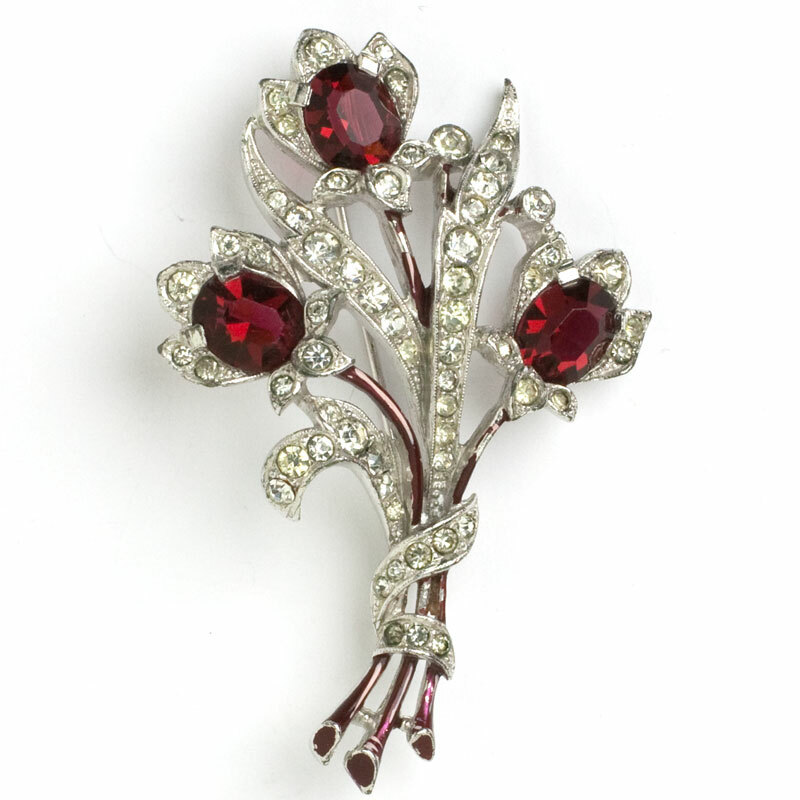 Although we tend to think of January birthstone jewelry as red in color, garnets actually occur in shades of green, orange, yellow, and blue. 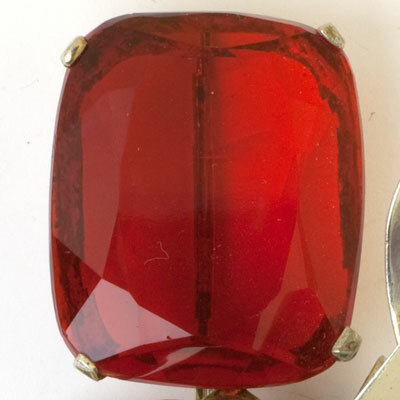 This gemstone, which symbolizes peace, prosperity, and good health, has a long history. 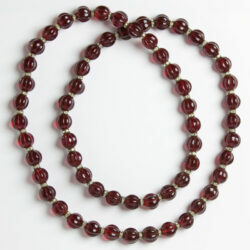 Red garnet necklaces adorned ancient Egyptian pharaohs and were entombed with them for the afterlife. Signet rings made from garnets were used by ancient Romans to seal important documents. This gem was favored by clergy and nobility in the Middle Ages. 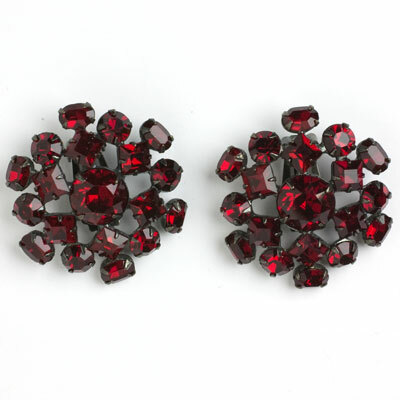 Jewelry from Bohemia, which featured clusters of tiny red garnets, was popular in the Victorian era. 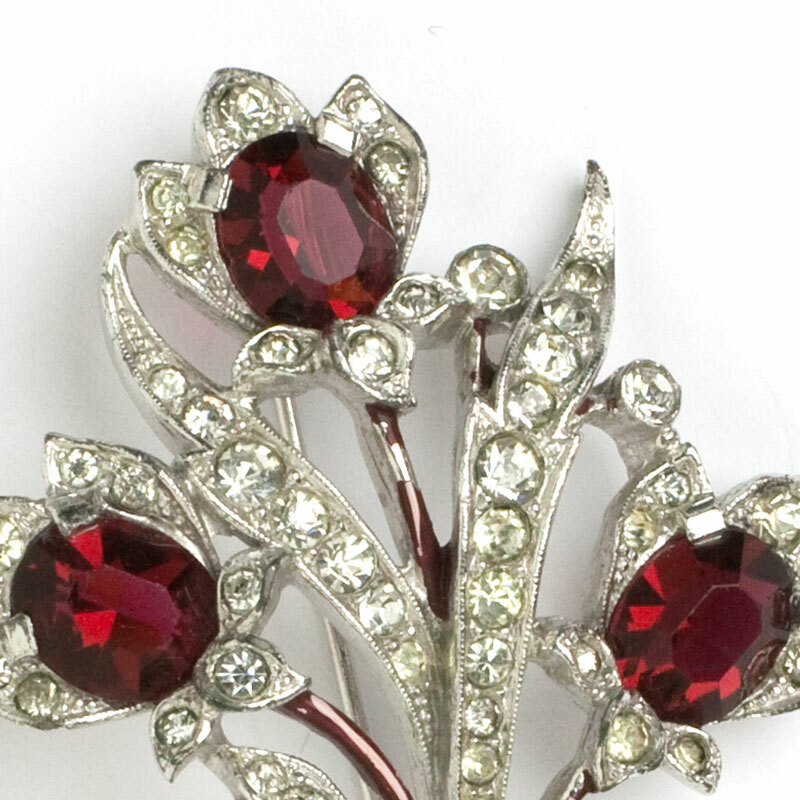 See examples of today’s fashions adorned with vintage garnet jewels. 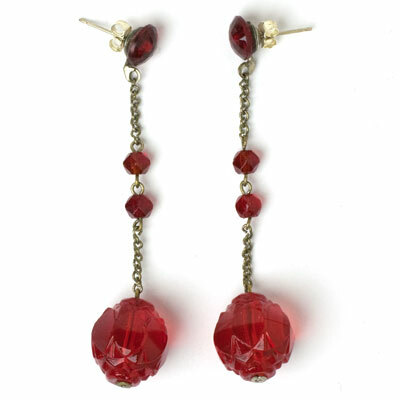 These long (2 1/2") ruby-glass Art Deco earrings feature a large, faceted drop suspended from silver-tone metal links and a collet-set round matching stone. The original screw-backs were converted to sterling silver ear wires with lever backs for pierced ears by my expert jeweler. 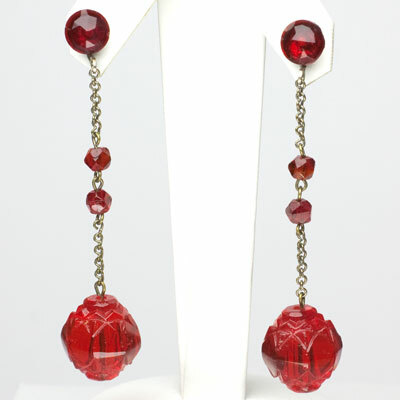 Earrings like these are a great jewelry wardrobe staple, especially for women who love Art Deco and long earrings! This delicate 1920s pendant necklace is another variation of the chicklet-style so popular in the Art Deco era. 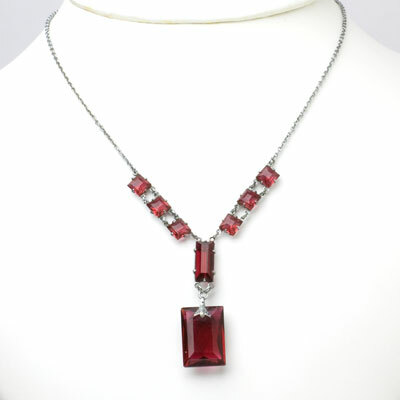 This piece has a beautifully-faceted, rectangular ruby-glass stone suspended from a smaller, oblong-shaped stone along with three chicklets on each side of the chain closest to the center drop. The metal is silver-tone and unmarked. This necklace closes with a spring-ring clasp. I don’t usually like pendants, but this one is special! It’s perfect for a v-neckline. 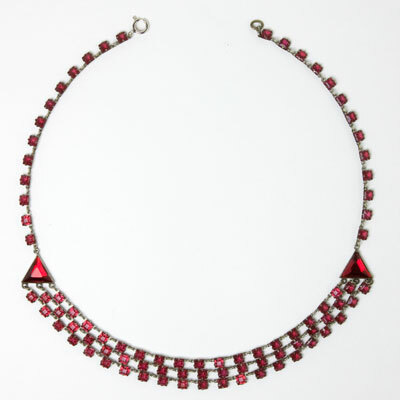 Single and clusters of blown-ruby-glass beads separated by crystal disks form this lovely 1920s-1930s necklace. 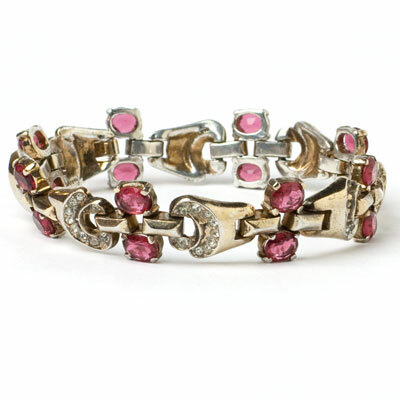 It closes with a filigree fish-hook clasp. 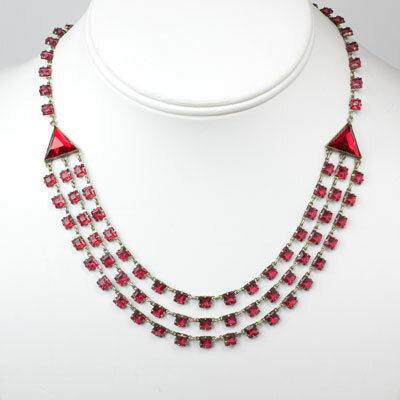 Reds are hard to match, so consider wearing crystal bead Art Deco earrings with this necklace. Scroll down to see them. 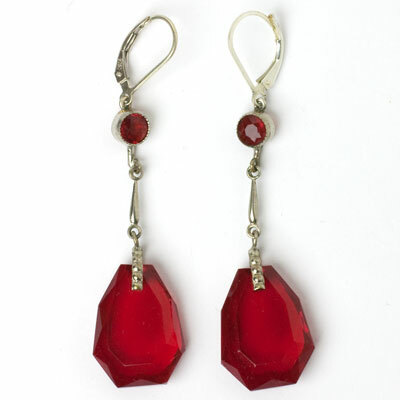 These Art Deco ruby bead earrings are long and luxurious pendants from the 1920s. 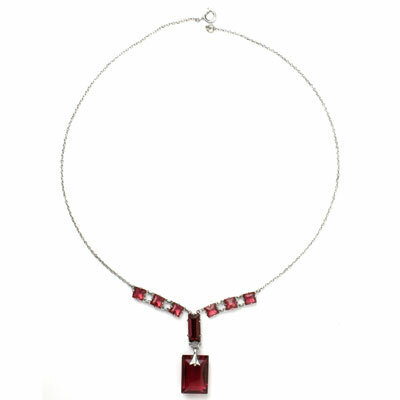 A molded ruby-glass bead resembling a flower is suspended from a silver-tone chain dotted with two small, faceted ruby-glass beads. A flatter bead in the same color glass is designed to adorn the earlobe. The original screw-backs on these earrings were converted to sterling silver posts for pierced ears by my expert jeweler. 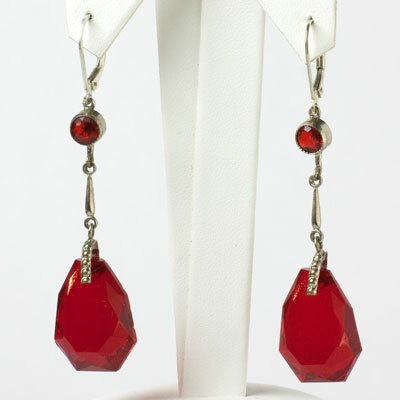 Lots of movement with these vibrant earrings, which are another great jewelry wardrobe staple. 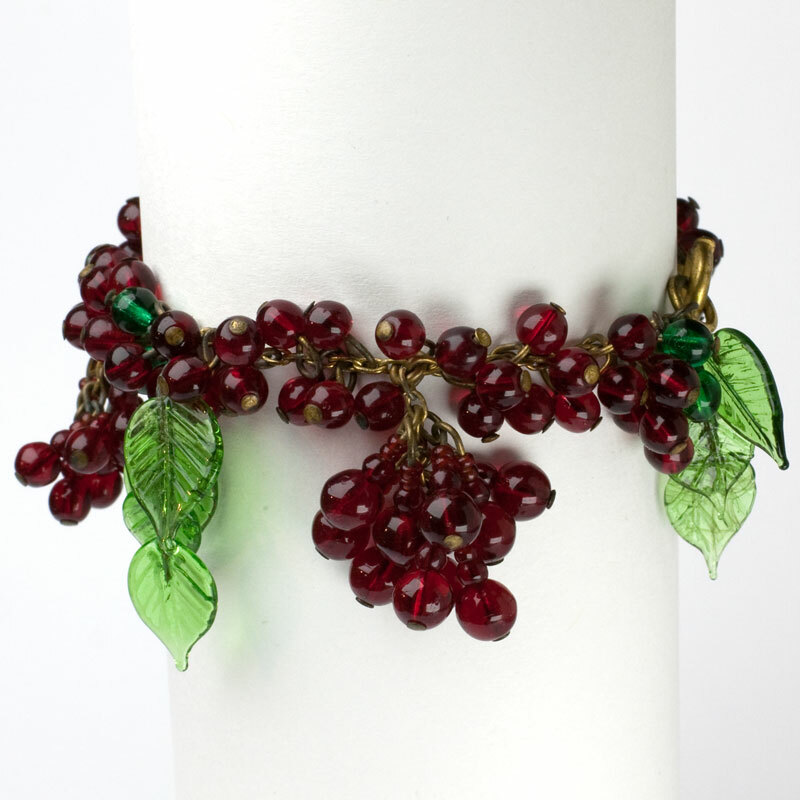 This emerald and ruby bead bracelet has glass beads intertwined with green-pressed-glass leaves, all dangling from a brass-link chain. 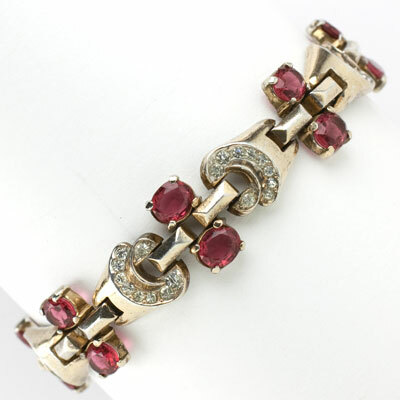 It closes with an old-style spring-ring clasp. 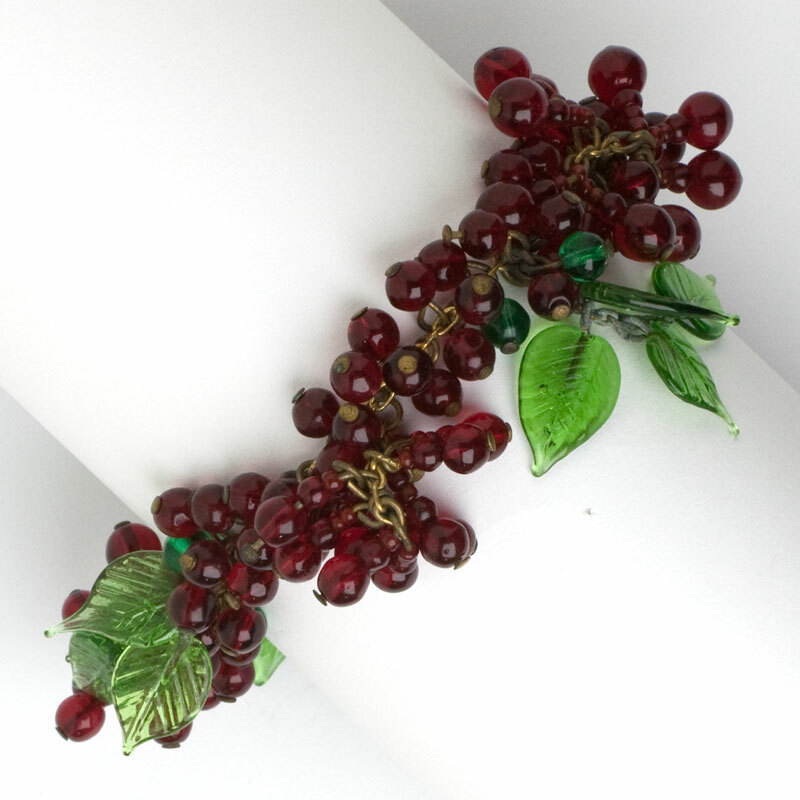 The design reminds me of a popular Art Deco motif – bunches of grapes. 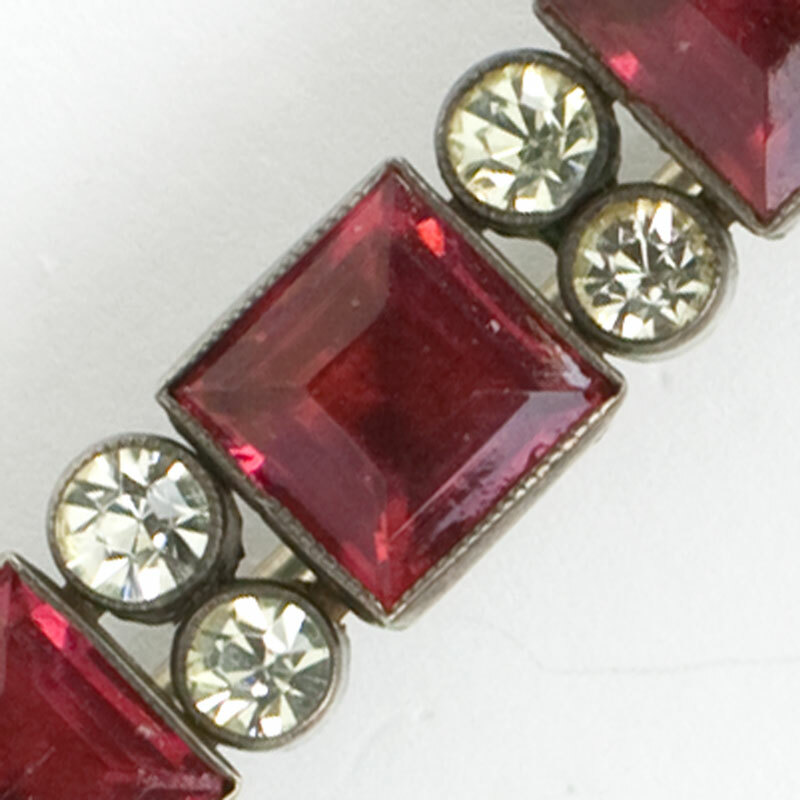 This 1920s bracelet is probably European in origin. A fun piece! 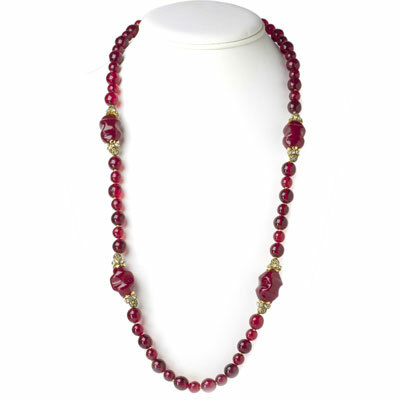 This ruby-glass bead necklace by Miriam Haskell is a 1950s classic. 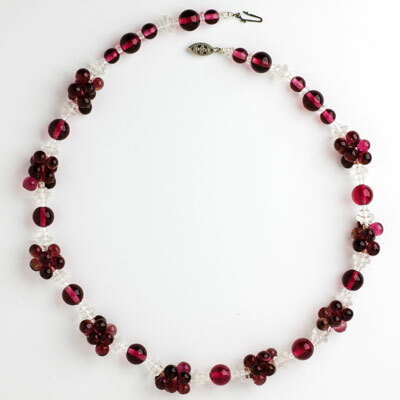 The round beads are accented with large glass nuggets in the same color. They have a Russian-gold-filigree end cap, a rondelle, and a small filigree bead on each end. The filigree-topped box clasp is embellished with rose montées. 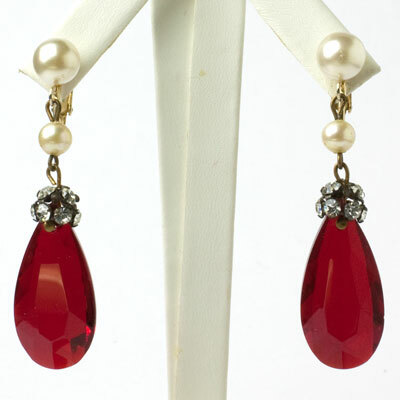 Made in a rich color with elegant, this opera-length piece can go everywhere and never goes out of style! 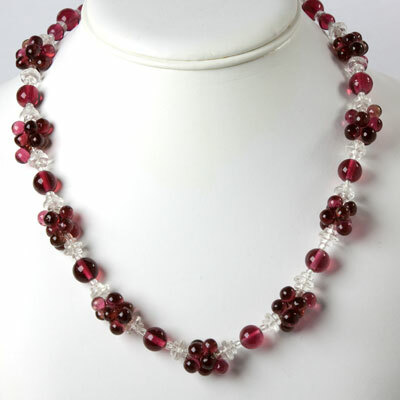 This vintage multi strand necklace is a variation of the chicklet-style so popular in the 1920s-1930s. 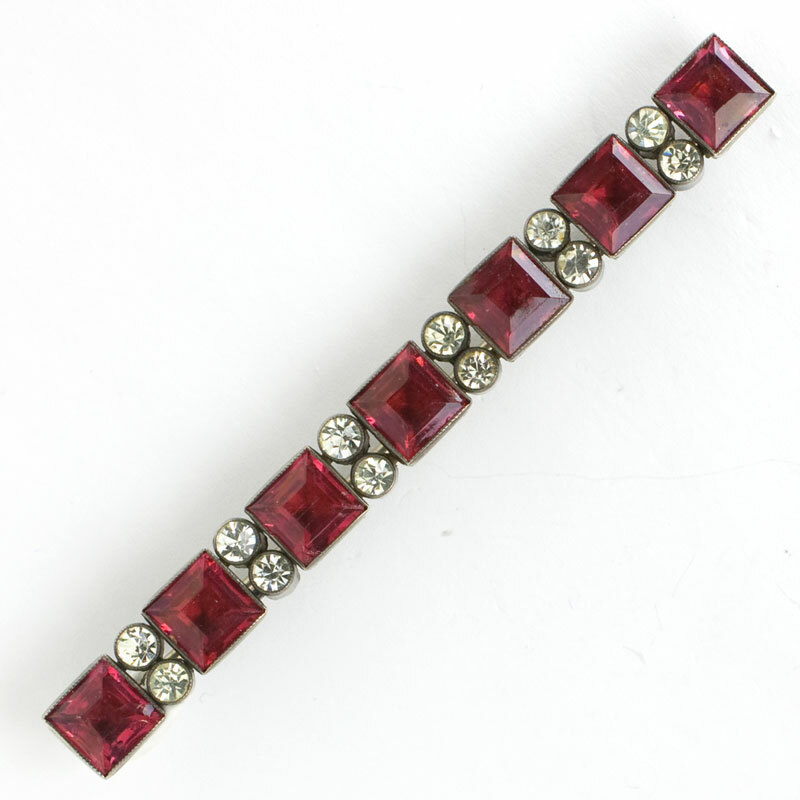 Three rows of faceted, ruby-glass chicklets drape in the front, with two larger faceted ruby-glass triangles joining the three rows to the rest of the piece. The chicklets are open-back; the triangles are not. 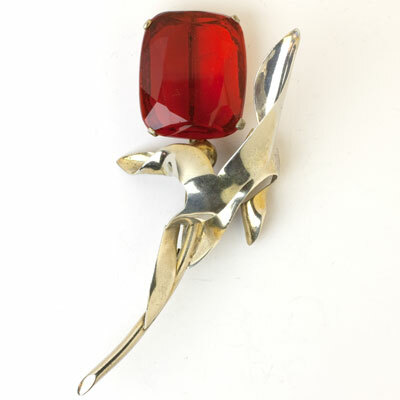 This unusual version of the classic chicklet in hard-to-find red closes with a spring-ring clasp. This necklace is probably Czech in origin. What a great piece for a round or scooped neckline! 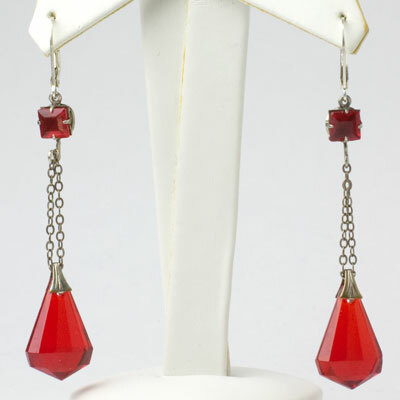 These vintage ruby drop earrings from the 1920s have faceted, three-dimensional, ruby-glass triangles dangling from double chains. At the top is a matching square-cut stone. The original screw-backs were converted to sterling silver ear wires with lever backs for pierced ears by my expert jeweler. 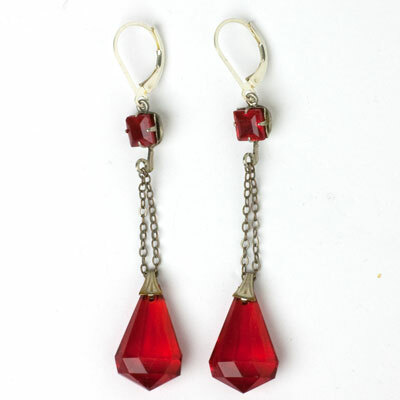 Ruby Art Deco pendant earrings are a jewelry wardrobe essential! 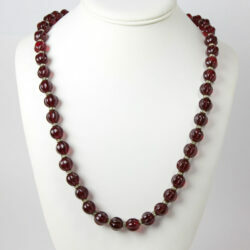 This vintage red glass bead necklace with rondelles is probably from France. 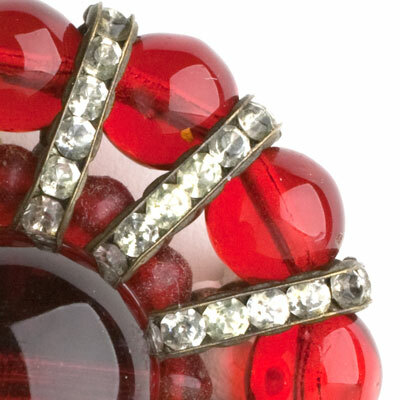 The uniformly-sized beads were molded in the shape of melons, a popular style in the 1920s-1930s. Wear this piece as a single long strand of 33 inches, or double it with a necklace shortener or ribbon tied at the back. 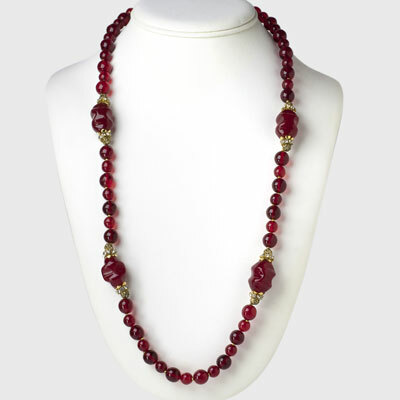 Either way, you’ll love the deep-red color and the substantial quality of these beads. This necklace from my personal collection has been professionally restrung. Just add simple diamond studs to complete your look. 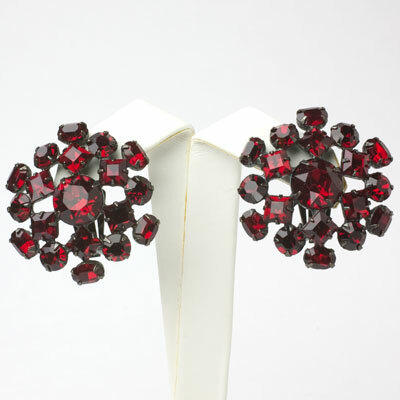 These 1950s earrings by Schreiner feature faceted, deep-red glass stones set in Japanned metal. He has combined round, square, and oval shapes to form what looks like a snowflake. 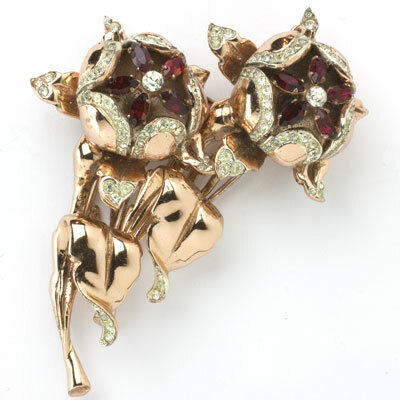 The design and hard-to-find color of these ear clips are just stunning! Wear them from day to evening in any season and feel extraordinary! In fact, they looked extraordinary on the model who wore them on the runway at Toronto Fashion Week for Spring 2019! 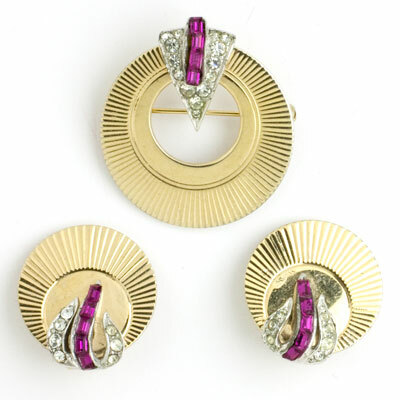 Marcel Boucher designed a number of circle pins and earrings in the 1950s, and this set is a lovely example of this work. 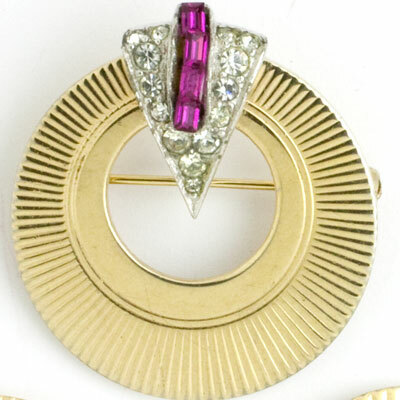 The gold-plated open-circle brooch is embellished with an arrow of pavé topped with ruby glass baguettes. The closed-circle earrings are embellished with the same stones in a leaf-like setting. Perhaps these pieces were not originally a set. 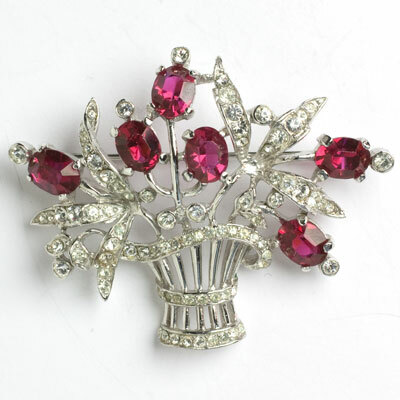 (The brooch is unmarked; the earrings have no inventory number.) Even so, they look great together! 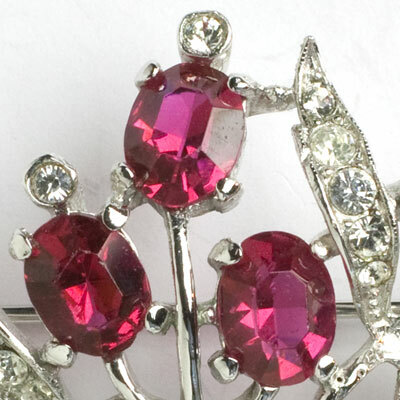 Large, faceted ruby glass teardrops with diamanté caps are the focal point of these lovely and elegant ear clips by Hattie Carnegie. 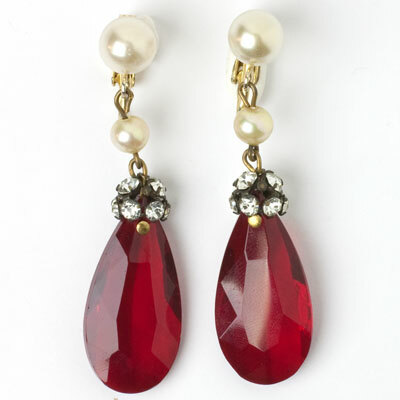 The rubies are suspended from two faux pearls – the top one adorns the earlobe. The setting is gold-tone. 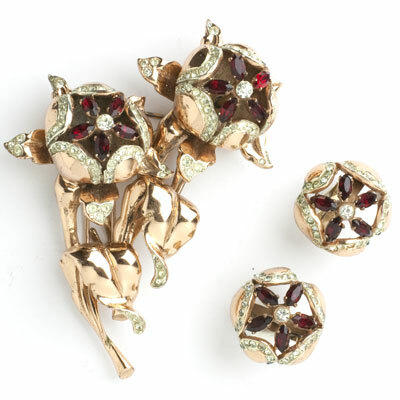 These 1950s earrings can go from day to evening wear with ease!